Whether he likes basketball, cycling, working the weights or another activity, give Dad a few hours—without worrying about his normal dad duties—to workout. No baby sitter? No problem. If Dad is working out at the Y, the kids can have a blast in childcare while you work out for up to two hours. And if you need a gift idea, consider a session with a Personal Trainer to make that Father’s Day workout even more beneficial. Take a bike ride or a hike: The Twin Cities is regularly ranked as one of the best biking communities in the world. With hundreds of biking trails throughout the Cities, you can have a family adventure within minutes of leaving your house. Try a family class at the Y: From Boot Camp and Family Fitness to yoga and water exercise—family classes are free for members. Do a family workout at home: Play “Family Fitness Bingo” or try one of our family fitness cards, which outline 20- to 30-minute, family-friendly workouts, including warm-ups and cool-down stretches. Gather friends or family together for outside games: From softball to freeze tag, neighborhood games you played as a kid can be just as fun as an adult, especially with a group of your favorite people. Hiking or walking: Venture onto one of the Twin Cities’ many hiking trails or just take a walk around the neighborhood. Incorporate scavenger hunts or nature walks to keep kids interested. Tai Chi and Yoga: There are classes in Tai Chi and Yoga for all ages at the Y. 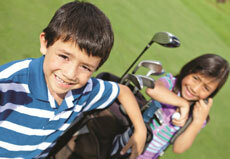 Golf: Whether you want to do 18 holes at a local course or mini-golf with the kids, golf will get everybody moving. Exergaming: Gaming systems geared toward fitness—such as a Nintendo Wii—have been proven to motivate multi-generational family togetherness (and fun). While it may not be an exercise, grilling is probably the activity most associated with Father’s Day. Try these recipes from The Chef Marshall O’Brien Group for nutritious and tasty grilling options for your Father’s Day feast.